I’ve had an incredibly productive week in the Philippines. This is my summary trip report. We have our 2012 dates locked in Manila and Cebu and we also have initial plans to launch in Davao. 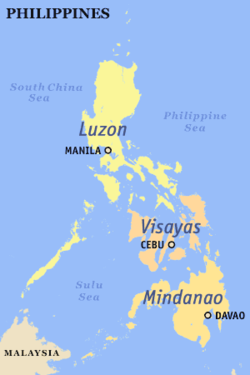 Our goal is to have 2012 be the year when we become ‘nation-wide’, running High Five Hope programs in the major cities of all three primary regions of the Philippines – Luzon, Visayas, and Mindanao (see map on the right). 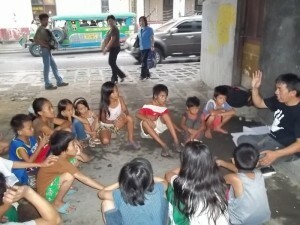 In Manila, I met with our great local partner ChildHope, and we walked through our 2012 plans. We are setting our goal next year to reach over 350 kids in Manila. After our meeting at Childhope, I spent some time on the streets with the kids, watching education session in the Lawton area, near downtown. It was raining pretty heavy so class was held under a highway overpass. The kids were focused and committed, using whatever was handy for school supplies – a rock or brick to sit on, or the wall for a writing surface. Many thanks to our wonderful partners at Childhope and all of the amazing people there who commit their life to helping others – Bheng, Rhea, Joey, Christian, Harry, Anna, and many others I’m forgetting, and of course my great friend Ms. Silva, a true inspiration. I then visited Cebu (Visayas region). There I had a chance to visit with our local partner Cebu City Task Force for Street Children, and talked about expanding in 2012 to include a volleyball program– which is a big priority for us in Cebu. With adding the girls volleyball program, and some other kids from outside the city and the boys from Operation Second Chance we are targeting over 450 kids in Cebu! Huge year over year growth, but I am thrilled with what we are accomplishing in such a short time. We then travelled to Operation Second Chance, a boy’s prison for teens in conflict with the law. They are doing amazing positive and rehabilitative work here in helping these boy s and keeping them from being thrown, as children, into the normal men’s prison system. 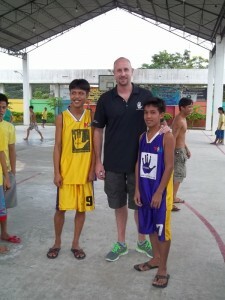 This boy in the blue jersey on the right, Jaymar, is at Operation Second Chance. A year ago, he was told he’d be paid a hundred pesos (about US$2) if he would take a package from one neighbor to another. It was a box of clothes, with drugs hidden inside. He was caught and is now in Operation Second Chance, his case still waiting to be heard. He was one of the star point guards in the 2011 High Five Hope program at Operation Second Chance. He asked if we could help him finish high school when he is out. We’re going to work on a pilot H5H scholarship program in 2012 for kids like Jaymar. We met another boy who has been in Operation Second Chance three times now, and told us he tries to get caught because being in jail here is better than life on the streets – at least he has food, shelter and protection. He was a smaller boy, with some sort of skin disease all over his body, and it was heartbreaking to hear a young boy, probably 13 or 14, talk about how he tries to get thrown in jail so he can be safe. Thank you to my friends in Cebu – it was great spending time with Reden from Cebu City Task Force, Warden Merlinda and my great friends Lane and Anjg. Coach Calib, sorry we didn’t connect – but I’ll be in touch and hopefully you guys did well in the Champions Tourney! My next stop was Davao, in the southern part of the Philippines (Mindanao region). This was my first time here, and it’s a beautiful area. I had a lunch meeting with two wonderful women, Susabel and Susan, who have great and long established connections in Davao and Mindanao. It felt like meeting two long lost Aunt’s, they are gregarious, big hearted and hilarious to talk with. They will help connect us to the right people and programs there so we can start (small) in 2012 in Mindanao. They had some exciting ideas that we will formulate a plan around; some ways to help that are very specific to this region. That afternoon I was able to see my awesome niece Jennifer, who is doing tremendous missionary work in the area. Jen, you are an inspiration to me and many others! It was great to see you and I am honored to be your Uncle. Keep up your work and see you next year! The next morning I met with Tambayan Center, a non-profit org that has been working in Davao for 15 years. 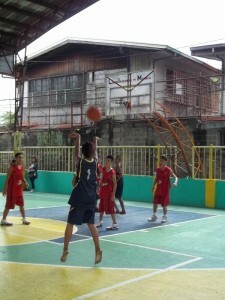 They primarily serve the welfare and rights of adolescent street girls in Davao City. After a conversation at their facility about the struggles and crimes that many of these girls live with on a daily basis, we talked immediately about how we can partner together in delivering a High Five Hope program for the 250 girls that they serve. Working in a developing country trying to help kids, I often come across stories that would make most people very uncomfortable to hear, but it is part of the reality of this work and this world. But the stories I heard, and the kids I saw there that day at Tambayan Center, were some of the most tragic I have witnessed, things that most of you would think could not possibly happen in our modern world. Ms. Edith, who runs the center, and I feel that there is a great match between her organization and High Five Hope. She also has the perfect attitude and focus: when discussing with her staff what types of sports we should introduce, she said “Let’s just ask the kids what they want to do, not what we think they want to do, let them be part of all the decisions and it will mean a lot more” I knew we would be a great match instantly. When we were walking out of Tambayan Center, I was looking at the paintings on the wall that the girls have created. 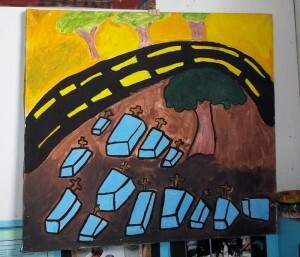 This one on the left struck me as a little odd, but Ms. Edith explained that they asked the girls to paint ‘where they feel safe’ – and this girl drew the cemetery near the streets where she worked, because that’s the only place that she felt safe to sleep at night. She is 11 years old and she still sleeps in the crypts of this cemetery each night. I am looking forward to starting our program in Davao and helping these kids feel even a small bit of hope in their lives. There are so many challenges with how quickly we are growing, and how much there is still left to do, but sitting there in this center, seeing these kids, I kept thinking of the John Wooden quote: “Do not let what you cannot do get in the way of what you can do”. Yeah, I’m a basketball nerd, I get it. Flew back to Manila and spent the morning with more of our High Five Hope boys in Paco. Patricia Hizon, High Five Hope Board member, arranged for a TV interview (GMA channel sports show called ‘GAME’) while the boys played some 5- on-5. I taught them how to play ‘bump’ and they had a lot of fun once they figured it out. I neecd to learn Tagalog for “get your own rebound!” Some of the boys who will turn 18 next year asked what we can do to help them after they are out of the program (we stop at age 17), and again we had more discussions about the H5H scholarship concept that we will pilot in 2012. Lots to do on how we implement this, how we raise funds, how we carefully manage progress at the student level, etc., but it’s clearly a key next step for us. We wrapped up with a discussion about the High Five Hope values and then the kids had some McDonald’s courtside. Was a perfect way to finish the trip. This was a great visit, with a lot accomplished for next year and the future. It was also deeply emotional for me. Spending this time with so many of our current (and future) High Five Hope kids reminds and rekindles why we are doing this. There were times during this visit that my emotions ranged from concern to how we can expand this quickly, to elation in seeing some of our multiyear program kids doing so well, to breaking down in tears hearing about the horrors some of these amazing children are going through right now. But that’s why we are here.